US Stamp 2015 - Misc. With this stamp in the Music Icons series, the U.S. Postal Service® honors Elvis Presley (1935–1977), the singer, guitarist, musician, and actor who became one of the first true stars of rock and roll. The USPS Exclusive CD 'Forever Elvis' is on course to go Top 10 on the Billboard Album Chart this week. If it hasn't been mentioned already -- One difference between this new stamp & the old stamp from 1993 is that this new one is self-stick/self-adhesive... no licking needed. - Correction - "If I Can Puke" according to The Man And His Music magazine. "If I Can Dream" really. That's a very good guess, Jerry. You're probably right. The name of the upcoming CD is "If I Can Puke"... well, according to this site. My guess is that it is a song that was prepared for the upcoming Oct? cd release, but it didn't make the final cut. What the heck is the name of that cd anyway? You know, The one with Elvis backed by symphony orchestra? On the special U.S. Postal Service CD the last track, "What Now My Love", is supposedly unreleased. Makes me wonder if it's from a mono soundboard recording? Overall, I like the stamp. Even if the photo shop job on the hair ain't perfect. Jeez, people. It's is after just a stamp. Happy licking. If I Can Dream (From upcoming Fall 2015 release, previously unreleased) What Now My Love (Exclusive to U.S. Postal Service release, "Elvis Forever", previously unreleased) Looks great, but I personally would have made it at least a 19-track CD by including the tongue-in-cheek novelty song, U.S. Male. Fun stuff! I will buy the CD/stamp combo for the sake of posterity. The image looks fine to me. I never liked the artist rendering of the first stamp from back in the day. The more I look at this new stamp the more I realize that there are some things in its favor. The chosen photo highlights Elvis' famous facial features in a very positive way. It captures his youth with the sincere eyes, the pouty lips, the chiseled jaw line, the slightly pointed nose, and the new sideburns... all at the dawn of his explosion to national popularity. Also, the subtle artwork with the little gold crown and the gold signature are nice touches that go well with the black-&-white image. And in comparison to another music icon ~ I think they used a much better, more flattering photo for Elvis than they did for the Johnny Cash stamp two years ago. Coming from England, this seems perfectly fine by me and keeps the 'man' in the subconscious, but then again perhaps I am easily pleased !!!
. . . "U.S. Male" wasn't/isn't really one of Elvis' greatest hits... concerning chart position... but I've always liked the lyrics to the song! Just for the sake of the occasion it would be fun if Sony included "Return To Sender" and "U.S. Male" on the CD, but of course "U.S. Male" wasn't/isn't really one of Elvis' greatest hits. Natha, all six of the stamps (so far in the series) have a different design. Do a search on Google for "Music Icons / USPS Stamps". Click that site and you'll be able to see them... Lydia Mendoza, Johnny Cash, Ray Charles, Jimi Hendrix, Janis Joplin, and Elvis. It is hard to compare the two stamps. One is in color and quite photoshopped, while this one is just his photo (well, from my fav period!). Not just as they tried to make him stand out. This time poorly photoshopped, but if ou ever worked with the programme you know that the real hair(line) is extremely difficult. It will always corrupt the natural ways hairs fall. Maybe this style fmatches with the other forever stamps (I don't know = anyone? ), so there might be a philosophy behind the chosen design. I think the photo on the stamp would've looked better if they had used the original (darker) background instead of cropping Elvis' image around his head and shoulders to accommodate a solid white background. Oh well, it is what it is... just a stamp. This one's nice. But I don't like it as much as the first one issued years ago. I'm sure it will sell well. I understand it’s the song If I Can Dream from the forthcoming collaborations album, remixed with The Royal Philharmonic Orchestra. It make sense if it is to promote the new album before it is released in September. No, not a "never before heard song", Cruiser621 -- It's "an Elvis song, as you’ve never heard it before."
. . . Whatever that means. Not near as good as the first issue, back in 1993 I believe and no color? I'm not impressed with this stamp at all. Further the US Post Office is going to charge $9.00 for 16 stamps at 49 cents each to include a supposed never before heard song on a CD; 16 stamps for $7.84 and an additional $2.16 for the CD. Good luck on that one. I'm disappointed to be blunt. I would have preferred a picture of Elvis in 69 or 70. I agree the Photoshop work was very amateurish, specially the area around the hair. I'm not sure this stamp will be as successful as the earlier one, which I also think was much more beautiful. Washington -- The U.S. 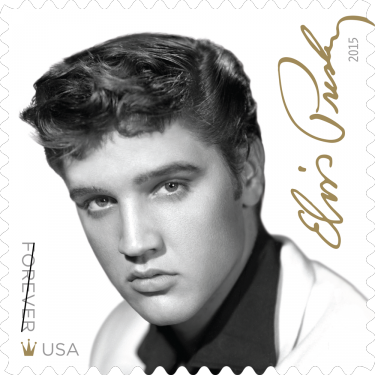 Postal Service previewed the Elvis Presley Forever stamp today and joined with Sony Music’s RCA/Legacy Recordings in announcing the upcoming debut of an exclusive music CD titled "Elvis Forever" that includes an Elvis song, as you’ve never heard it before. The CD will be available online and in select U.S. Post Offices beginning August 12 — on the same day as the Elvis Presley stamp dedication ceremony. Great looking stamp. Glad they got it right!! !